Handcrafted Metal makes exquisite stainless steel kitchen island to suit your taste and accommodate your kitchen. With us you can customize every dimension and feature. You can also add detailing, such as fancy edges, backsplashes, hammering, and drainboards, to give your stainless kitchen island a powerful presence in your kitchen. Each stainless kitchen island is fully welded and polished, and made with 14 gauge stainless steel, which is 25% thicker than 16 gauge. Feel free to choose how your stainless kitchen island will look, by combining our custom features into the perfect custom stainless steel kitchen island for your kitchen. We will work with you to produce a work of art for your kitchen. To get started, click any of the kitchen island countertops below to see pricing and customize your dimensions and features. This modern island is 14 gauge stainless with straight line micrograin finish. 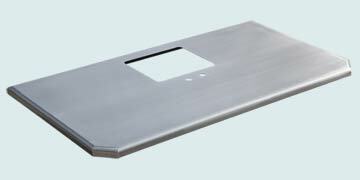 The width of the island fits on a single sheet of metal and so can be fabricated economically. All welded 14 gauge stainless. Simple channel edges, square corners, and matte finish give this top a modern industrial feel. All-welded 14 gauge stainless steel. This island is an economical way to get our 14 gauge stainless steel over existing counter tops. The size of the stainless needs to be a bit bigger than the existing piece so it covers what is already there. The Normandy edge is a little taller to cover the existing edges. Smooth stainless, straight line micrograin finish. This practical island keeps the maximum amount of edge space free with the sink neatly in the corner. The Claire quarter roll edges give this top a soft perimeter. Smooth 14 gauge welded stainless steel, straight line micrograin finish. A large rectangular sink in the corner provides real utility on this island. Bullnose edges and spherical corners soften the appearance. Smooth stainless, straight line micrograin finish. The long diagonal corner allowed this large island top to fit into the available space in the kitchen. Our flat matte finish makes this stainless top a color similar to zinc. Smooth stainless, flat matte finish. This stainless Island countertop is functional and has a classic look. Our Claire Half-Round edge at 3 inches tall gives the piece a substantial feel. The fine matte finish takes the shine off the metal. This finish makes stainless look alot like zinc. Smooth stainless, matte finish. This stainless Island hood is a real eye-catcher. It has our Butterfly finish, and features a raised edge to trap water. It also has a veggie sink set between two larger sinks. This stainless Island features our fine matte finish and a large double sink. 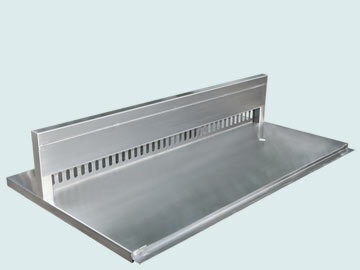 An integral sink has no lip - it is part of the top - so it is easy to keep the top clean. The marine edges keep water on the countertop and make for easy cleaning, too. All welded 14 gauge stainless with fine matte finish. This stainless Island countertop is elegant and elongated. It's entirely smooth and has our fine matte finish. The half-round Claire edges give it an old-fashioned look. Fully welded corners. The customer provided the size of the cooktop cutout. 14 gauge stainless. A very clean, simple island with Normandie edges. We made the size 55 in x 55 in, the largest dimensions that will fit onto a single sheet of stainless. The integral bar sink fits nicely onto the angled 5th side. Smooth stainless, straight line micrograin finish. This large island includes both an integral sink and a cutout for a drop-in range. Bullnose edges are mitered at the corners to give a classic look. Smooth stainless, straight line Grain finish. Handcrafted Metal takes pride in our very high quality craftsmanship. We see your Custom Stainless Steel Kitchen Islands order as an opportunity to deliver our uncompromising design and craftsmanship. You can see that we offer a large number and an amazing variety of stainless island kitchen tops designs. Our 25 years of experience in building stainless steel island kitchen tops in every size, shape, and color gives us mastery of the essential methods, processes, and skills needed to produce a stainless kitchen island that exceeds your expectations. 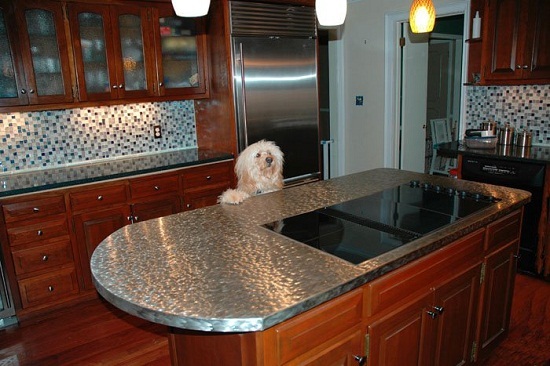 We have built thousands of Stainless Kitchen Islands. The vast array of styles, finishes, textures, and metals available for Handcrafted Metal Island Kitchen tops provide almost unlimited choices. 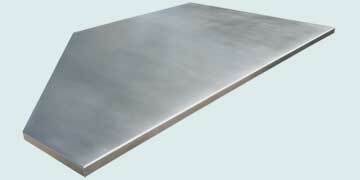 We offer an extensive selection of Stainless Kitchen Island Countertops styles. Just browse the Stainless Steel kitchen Island Style to see wide range of copper kitchen islands products . We are glad to answer any questions about any of our Stainless Island Kitchen Counter tops. Call 1-800-755-0310 to speak with a product specialist who will help you select and configure your ideal stainless kitchen island. Handcrafted Metal Kitchen Island and Island Kitchen Counter top are built in a way to be the focal point of your kitchen or Bar.